Separated during a natural disaster that took place over a year ago, a Japanese man is hopeful that he might soon be reunited with his beloved Harley-Davidson. In the prolonged aftermath of the earthquake and tsunami that struck Japan on March 11, 2011, one man, who suffered great personal tragedy after losing three family members and his home in the disaster, has been given a little good news. His prized motorcycle that was lost during the disaster has turned up in Canada. 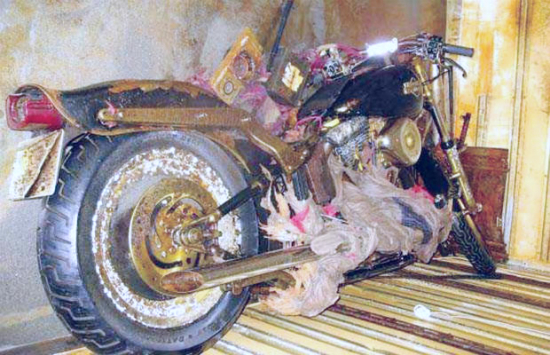 The Harley-Davidson found by Peter Mark represents a tiny portion of the Japanese flotsam that has been washing ashore in British Columbia for the past several months. Among the sundry items found so far is a fishing vessel, which had to be sunk as it posed a danger to local shipping. Mark contacted the Japanese consulate with the details of his find on British Columbia’s Graham Island. The machine survived the arduous, year-long, 7,000 km trans-Pacific voyage in a Styrofoam-lined storage container along with other personal items such as camping gear, golf clubs and work tools. The ravages of the journey were obvious; according to Mark the wheels and handlebar were completely frozen by rust. The Harley-Davidson’s owner, Ikuo Yokoyama, was located by tracing the motorcycle’s license plate, which indicated that the motorcycle came from Miyagi prefecture, the region hit hardest during the disaster. A Harley-Davidson representative in Japan tracked down Yokoyama, who had reportedly purchased the bike five years ago and used it to travel across Japan. The final chapter in this motorcycle’s adventure has yet to be written. Extending his Good Samaritan role, Mark reportedly also contacted Steve Drane Harley-Davidson in Victoria to see if they could help return the motorcycle. In response to the request, dealership owner Steve Drane claims to have already collected over $10,000 in pledges earmarked for the bike’s restoration. Harley-Davidson has also offered to help by performing the actual repair work at one of its facilities in Japan. However, before the bike makes its return voyage Drane wants to put it on display in his store to give everyone a chance to see the miracle machine. He also plans to send the bike back with mementos from Victoria along with a note for Yokoyama written in Japanese.